Alexa can now respond to your whispered voice commands by whispering back to you, which is cool, but takes some getting used to. 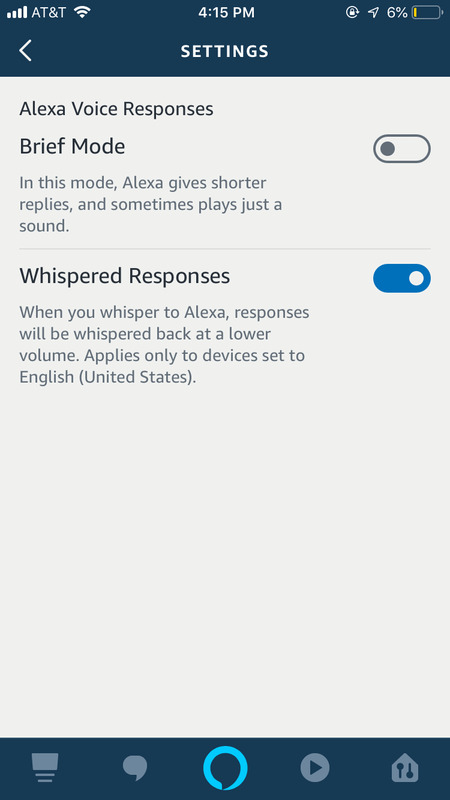 The “whisper mode,” announced back in September, was rolled out as part of a series of features aiming to make Alexa’s speech more intuitive and natural. “Whisper mode” is turned off by default, so you have to manually enable the feature. It’s not hard to tell the difference between Alexa’s automated voice and human speech, but a new feature that lets her speak to you in a whisper makes her eerily more life-like. This “whisper mode” means your Amazon smart speaker can detect when you talk to it in a whisper, and will trigger Alexa to whisper back to you. The feature was announced back in September, but it was made available for English speaking Alexa-enabled devices on October 18. On the surface, the whispered voice is smart for situations where a loud noise could cause a disruption, like in a room where people are sleeping. Amazon says the feature is only one of many it’s working on in an effort to make its AI-powered Alexa speak more naturally and respond to your conversation cues more intuitively. The new feature is by default not activated, so you have to enable it yourself. Whether your reasoning for switching on the feature is for practical reasons or for a good laugh, the easiest way to enable the mode is to just ask Alexa herself. Say, “Alexa, turn on whisper mode,” and the feature will be enabled. Otherwise, if you’re not near your Amazon smart speaker, you can easily toggle on the feature through the Alexa app. By clicking on the menu button (three horizontal lines) in the top left corner of the app, the rest is easy. Just hit Settings > Alexa Account > Alexa Voice Responses > Whispered Responses.